This 1969 extremely clean 34.5mm. 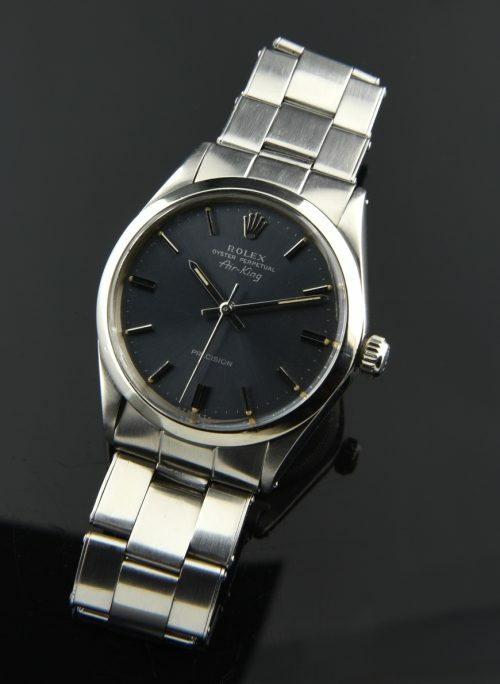 ROLEX OYSTER PERPETUAL Air-King with the original and UNCOMMON SLATE dial is as clean as you will find. This spectacular looking dial is very understated, spotless and classic in its design with raised steel baton markers and matching ORIGINAL hands and luminous. The ROLEX OYSTER winding crown screws down like silk. The automatic ROLEX 25 jewel movement was just cleaned and is accurate. The original riveted ref. 7206 ROLEX OYSTER bracelet is very clean and dates to 1970. You can wear this one every day. Colured or toned ROLEX dials are VERY collectable. This fine vintage ROLEX will look great with jeans or a suit.